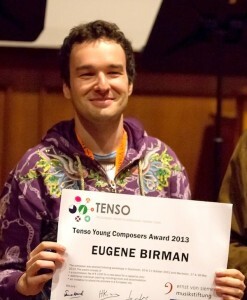 Say hi to Eugene Birman, the winner of the Tenso Young Composers Workshop in 2013. After going through an early round in Stockholm and working with James Wood as a coach, Eugene was appointed winner among the 3 selected finalists. The jury highlighted the careful thought behind Eugene’s work and the communication skills showed during the workshop as key points for the award. He will receive €1500 for the commission of a new choral piece to be sung by Tenso choirs and additional individual coaching. Eugene’s new work will be premiered by Latvias Radio Koris during Tenso Days Mechelen 2014.